Our best picture of the warlike side of the Britons comes from the account written by Julius Caesar about his two expeditions to Britain in 55 and 54 BC. Although he gives the impression that they were reconnaissance expeditions, it is fairly clear that on the second visit he was determined on the conquest of Britain which, however, was not carried through. The central regions of Britain are inhabited by a people who claim to have originated there, on the coast live the immigrant Belgae, who came to plunder and fight, but stayed to cultivate the land. The population is very large; they have many houses rather like those in Gaul [France] and large herds. 'They use bronze or gold coins or, as an alternative, iron rods of fixed weight. Tin is found inland and small quantities of iron near the coasts but they import their copper. Apart from the beech and fir, there are trees of every kind as in Gaul. They think it is wrong to eat hares or chickens or geese but they breed them as pets. As the cold is less severe, the climate is more temperate than in Gaul. "The island is triangular, and one side, about 175 (Roman) miles long, is opposite Gaul. Kent forms one corner and nearly all the ships from Gaul land there. This side points east while the other points south. Another side looks west towards Spain; the Britons reckon it is roughly 665 miles long. "In this direction is Ireland which they reckon is about half the size of Britain and about the same distance away from it as Gaul. In the middle of the Irish Channel is the Isle of Man; they think there are a number of smaller islands off the coast. Some geographers have written that in midwinter in these islands there are about thirty days continual darkness. "Though I made enquiries, I could find nothing about this, but we did discover from accurate measurement by water-clock that the nights are shorter than on the Continent. The third side, thought to be 760 miles long, looks north with no land opposite, but one corner points roughly towards Germany. The circumference of the whole island measures 1,900 miles. "The most civilised people are those in Kent which is entirely a coastal area; they have much the same customs as the Gauls. Most of those living further inland do not sow corn but live on milk and flesh and wear clothes of animal skins. All the Britons, though, dye their skins with woad which produces a blue colour and thereby look all the more terrifying in battle. "They do not cut their hair but shave all the rest of the body except the head and upper lip. Wives are shared between groups of ten or twelve men, usually made up of brothers or fathers and sons. The children are reckoned as belonging to the man each girl marries first." "I have nothing very certain to say about this island except that the inhabitants are less civilised than the British, for they eat great quantities of food - and men as well. Moreover, they consider it an honourable thing, when their fathers die, to eat them...."
Caesar set sail from Boulogne with some ten thousand men in eighty transports at about midnight on the 25th August 55 BC. The cavalry were to embark from a spot further north and follow the main fleet. Caesar reached the British coast at about nine o'clock in the morning under the cliffs of Dover. Above him he could see the British forces so he dropped anchor and waited for the whole fleet to gather together. At about 3.30 they moved off northwards along the coast and found a suitable landing place somewhere between Deal and Walmer. But the British had followed him along the coast and were there to greet him with their cavalry and war chariots and the Roman infantry were reluctant to land until a standard-bearer jumped into the surf and started to wade towards the beach. A fierce fight developed and the Romans only got ashore with difficulty but, when the British did run off, Caesar was unable to chase them because his cavalry had still not arrived. However, some of the British had second thoughts and came back and offered to co- operate with the Romans. 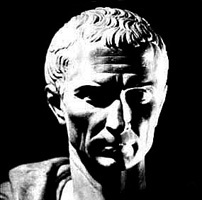 Caesar spent the next two days waiting for the cavalry. Their ships met with a tremendous storm on the crossing and thought it safer with the horses on board to return to Gaul. The storm had a disastrous effect on Caesar's camp which he had constructed on the shingle foreshore. The warships had been beached and these were damaged together with the transports which were riding at anchor a little way out. "They began by driving all over the field hurling javelins then they worked their way between their cavalry units where the warriors jumped down and fought on foot. Meanwhile the chariot drivers retired a short distance from the fighting and stationed the cars in such a way so that their masters, if outnumbered, had an easy means of retreat to their own lines. "In action, therefore, they combined the mobility of cavalry with the staying power of foot soldiers. Their skill may be judged by the fact that they control the horses at full gallop on the steepest incline, check and turn them in a moment, run along the shaft, stand on the yoke and get back again into the chariot quick as lightning." A few days later the British gathered a large force and attacked the Roman camp but were driven off and the Romans chased them, as well as they could, with the few horses that they had, killed the stragglers and burnt several houses. Later that day, British envoys arrived to make peace. Caesar demanded that hostages be brought over to Gaul, decided to make the best of a bad job and set off back to Boulogne. Before leaving for Italy, he decided to make a full attempt at conquest next year and left orders that preparations should be made. Next year he repeated the voyage, with 800 ships this time and 2000 cavalry, and built a camp, probably in the same place as the previous year. There he received news that the British force had withdrawn from the beaches to a fortified place at Bigbury Woods, some distance inland, not far from present-day Canterbury on the River Stour. Leaving ten battalions and 300 cavalry to guard the camp, Caesar set off inland, following the track that led to the crossing of the River Stour. He arrived there to find that Bigbury was a strongpoint overlooking the crossing-place and that the Britons were pouring down the slope with their cavalry and war-chariots to bar his passage of the river. However. he managed to cross and attacked Bigbury which had its entrances blocked with masses of felled trees. The troops of the Seventh Legion, working under cover of interlocked shields, piled up branches against the fortifications, stormed the position and drove the Britons out at the cost of a few minor casualties. The Romans spent the rest of the day building a marching camp. Next morning Caesar sent out a light force of infantry and cavalry in three parties to overtake the Britons. Just as they were leaving, a messenger arrived from the Roman camp on the seashore with the news that an overnight storm had wrecked nearly all the ships! After what had happened last year, this was incredible news. It shows how little the Romans had learnt from that experience. So, there was a delay of ten days during which time the camp was refortified and the ships beached inside it. When he got back on the road to Bigbury, Caesar found that the British had offered the leadership of their disparate forces to Cassivellaunus, king of the Catuvellauni, whose territory lay beyond the Thames in the region of Middlesex, Hertfordshire and Buckinghamshire. He began to attack the legions on the march and a running fight developed. When the Romans entrenched for the night the Britons attacked the outposts. Heavy fighting developed and the Britons were only driven off after reinforcements had been brought up. Next morning the fight was resumed. After a concerted effort by the legions and the cavalry the Britons withdrew and Caesar was able to resume the march. They reached the River Thames at present-day Brentford. This must have been anticipated by Cassivellaunus who had sharpened stakes stuck into the river bed beneath the water and on the banks. On the other bank was the British army. The Romans' blood was up. Without delay they dashed across the river and scattered the enemy. When all his troops were across, Caesar set out for Cassivellaunus' stronghold at Wheathampstead near present-day St Albans. 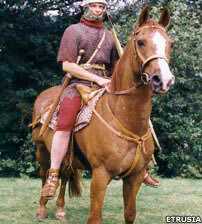 All along the line of march he was under attack from the British cavalry and chariots. Whenever he sent out patrols or cavalry to plunder the countryside, they were cut off and attacked. 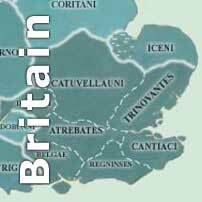 On this march envoys arrived from the Trinovantes whose territory lay in Essex and southern East Anglia. Their king had been assassinated by Cassivellaunus and his son had fled to Gaul to seek help from Caesar. In return for hostages and a promise to submit to his orders, Caesar sent the young man back to his people with the envoys. As a result of this decision, Caesar received offers of help and friendship from five more tribes in southern and western Britain. This heartened the Roman force and when they reached Wheathampstead, the oppidum was immediately attacked from two sides and, after, a brief resistance, the Britons retreated. Caesar says that great quantities of cattle were found there. Meanwhile, Cassivellaunus had instructed four of the Kentish leaders to make a surprise attack on the Roman HQ on the coast, In the engagement one of the Kentish leaders was killed and the rest driven off. 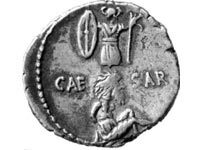 Caesar tells us that he decided at this point to winter in Gaul so he demanded hostages from the Britons, fixed an annual tribute to be paid to Rome (acting as though he had conquered the country) and forbade Cassivellaunus to interfere with the Trinovantes. He then marched back to the coast and, after some problems due to a shortage of transports, managed to load up his army and returned to Gaul. He never came back to Britain. Archaeological evidence for these expeditions is very sparse. The site of Bigbury is known. It is situated on the Downs, on the North Down trackway, overlooking the route which Caesar took on his way to the Thames. The main earthwork consists of a rampart 2.4m high and an outer ditch some 5m wide and encloses some 3.2 hectares. There are two entrances and an annexe on the north-west. The interior has been vandalized by gravel digging during which a good many finds have been made including a fire-dog, cauldron hooks, ploughshares, horse-bits and a slave-chain with a barrel padlock. From the Thames at Brentford has come one of the stout stakes sunk into the river. At Wheathampstead, the Devil's Dyke and another earthwork called the Slad together enclose about 36 hectares. The Devil's Dyke is massive, some 457m long, 12.2m deep and nearly 40m wide at the top. The Slad may be natural. So far efforts to find traces of Caesar's camps have been unavailing. 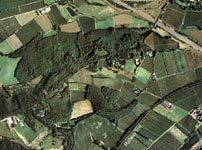 The site known as Caesar's Camp in Surrey is an early Iron Age hill fort. The Iron Age warriors had a fearsome reputation and we can see that they were able to put up a good show even against Caesar's highly trained professional army. As mercenaries they were employed as far afield as Greece and it was the warriors returning to Gaul after the terminations of their contracts who brought with them their pay in the form of Macedonian staters who provided the prototypes for the Gallic staters minted by various Iron Age chieftains. These coins were also copied in Britain. It is clear from what Caesar says that the use of chariots in warfare was old-fashioned at the time but this did not prevent them being very effective against the Roman infantry, and they were only overcome when Caesar was able to deploy sufficient cavalry on his second expedition. The problem with all ad- hoc forces which are only brought together on specific occasions is their lack of training. Cassivellaunus, however good a soldier he was in native warfare, would have found that at such short notice it was was virtually impossible to control his troops tightly enough to win against a professional army. It seems clear that, by the end of the campaign, Caesar was as anxious for peace as Cassivellaunus, and it is probable that it was he who proposed a settlement to Cassivellaunus, since it was Commius, Caesar's ally, who conducted the negotiations. The situation in Gaul had become so dangerous at the time that it took Caesar three years hard fighting to put down the several rebellions that broke out in the winter of 54 BC so he never had time to consider a third expedition to Britain. There is no doubt that he had failed in his second expedition and that Rome knew this as well as he did. Though he had in fact met and defeated far larger forces than in his first campaign when a public thanksgiving was decreed for twenty days and triumphal gateways set up, no thanksgiving was decreed this time. "On October 24th I received a letter from my brother Quintus and from Caesar, sent from the nearest point on the shore of Britain on September 25th. They have settled affairs in Britain and taken hostages: there's no booty, though they have imposed a tribute; they are bringing the army back from the island." The warriors who confronted Caesar in their chariots were the aristocrats. They were able to afford the equipment, the chariot and the driver, a magnificence at odds with what little we know of their rustic homesteads. Their martial tradition must have been a strong one, judging from the fact that in the Arras culture, many were buried with their weapons and some with their chariots but it is difficult to know how the tradition arose. It may be that it has its origin in the Late Bronze Age when the leaf-shaped swords and the horned helmets were in vogue and so martial activity had a pedigree of several hundreds of years. It gives us an insight into the society of the time which we can broaden by adding to the picture the Druids, the guardians of the social and religious traditions of the period and we can also add the new industrial traditions that were growing up at the time and base them all on the age-old tradition of agricultural production which was the bedrock of Iron Age society. Text copyright © Dr Ron Wilcox. The copyright of these texts remains with the author but you are free to copy and distribute parts of them to others in electronic form provided that: (1) it is for educational use; (2) no charge is made; (3) the copyright owner is duly acknowledged. Using them in any other way without author's written permission is forbidden.